Take one of the most beloved 15-inch laptops, drop in a wickedly fast 8th gen CPU Core i7 and better graphics, and you have the XPS 15 9570. You know who has an easy job today? Dell’s XPS 15 designer. That’s because the popular 15.6-inch laptop gets the upgrade it deserves with Intel’s 8th-gen 6-core Core i7 chip. Dell also tucked in a GPU upgrade to make what is ultimately the fastest XPS 15 we’ve seen yet. Dell hasn’t changed much on the outside of the XPS 15 since we first reviewed it in 2016. It has to be mentioned, that it hasn’t changed much since the 2017 iteration either. In fact, you can go back and read those reviews to see what we think of the keyboard, build quality, trackpad, and aesthetics, because for the most part, it hasn’t changed from what we can tell. That is, for the most part, a good thing. Other companies have mostly gone where Dell led, starting with its superthin “InfinityEdge” bezels around the 15.6-inch screen. The lid and bottom are aluminum, and the keyboard deck is wrapped in a slightly rubberized carbon-fiber material. The body itself is 9.3 inches deep, 14 inches wide, and from 0.45 to .066 inches tall. Dell rates the laptop alone at four pounds. The model we reviewed, with a larger battery, came in at 4.25 pounds. If you opt for the version with a 4K touchscreen display, the weight bumps up to 4.5 pounds. If you look close enough, you’ll find one change that’s long overdue: A fingerprint reader, integrated into the power button in this iteration. It’s a modern-day, full-pad reader, unlike those ancient and flaky swipe-style readers. But still no infra-red camera, in case you’re wondering. 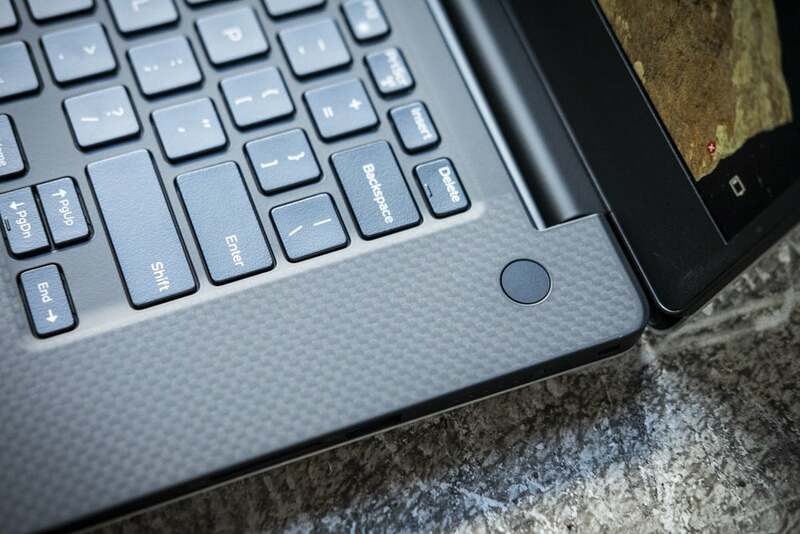 The new Dell XPS 15 9570 adds a fingerprint reader in the power button. 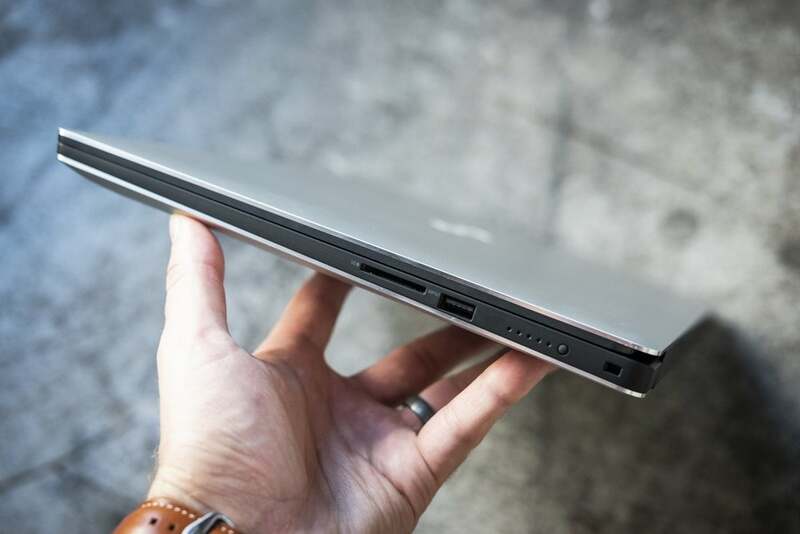 A full-size SD reader and USB Type A, plus a Noble Lock port, are on the right side of the new XPS 15 9570. 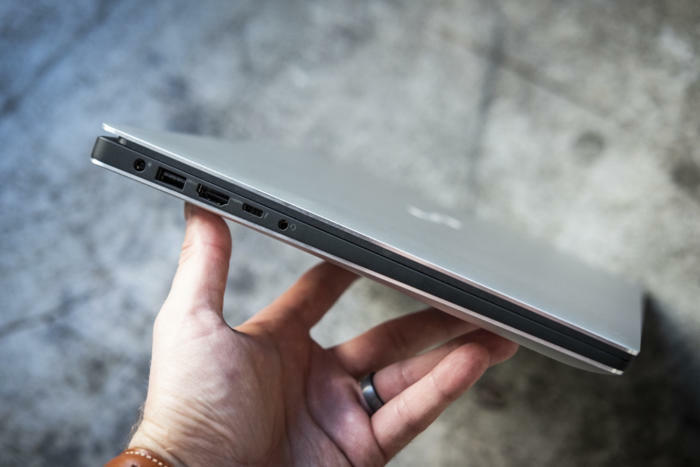 The left side, more importantly, features an update to the single Thunderbolt 3 port that people have complained about since this model was introduced: performance. The previous two XPS 15’s (the XPS 15 9550 and XPS 15 9560) featured Thunderbolt 3, but using only two lanes of PCIe. With the XPS 15 9570, Dell finally gives you a faster Thunderbolt 3 implementation using four lanes of PCIe. This basically means external PCIe storage and graphics performance should get a bump. The left side of the XPS 15 9570 has another USB Type A, HDMI 2.0, headphone port, charging port, and a four-lane Thunderbolt 3 port! For the most part, the biggest change to the XPS 15 9570 is its CPU. Make no mistake, Intel’s 8th-generation Core i7 CPU is in the laptop. As our review showed, the CPU is one of first in a long time that might be worth the upgrade over the last generation of CPUs (we more often recommend you wait a generation or two before upgrading). The secret sauce are its two extra CPU cores over and above the 7th-generation Core i7 chips. 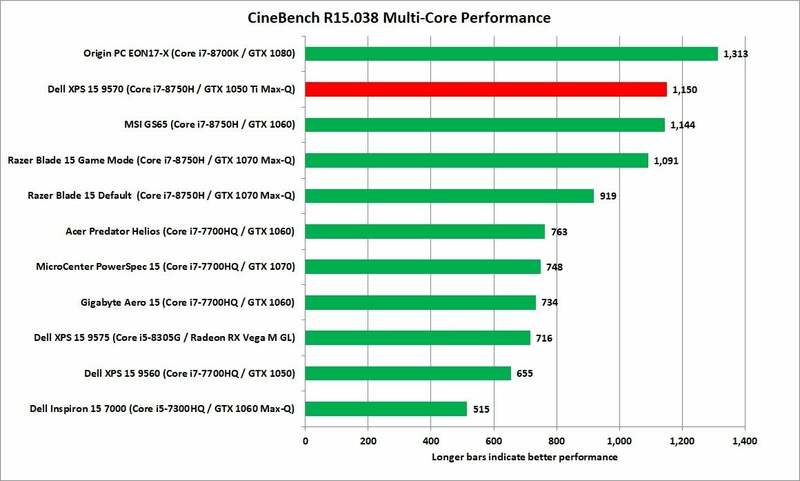 You can see them in action in our first benchmark: CineBench R15. It’s a test based on an engine used in Maxon’s Cinema4D modeling application. The new XPS 15 represents quite well and pretty much sits with the other 6-core Core i7 CPUs in performance. The 6-core 8th gen Core i7-8750H is no joke in multi-threaded performance. 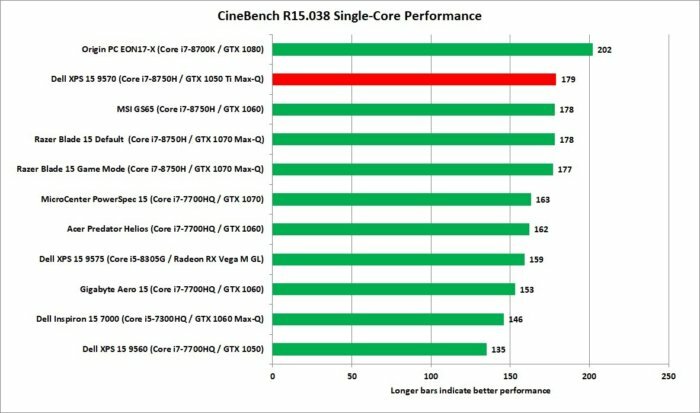 The computing world is not all about multi-threaded performance, though, so we also run CineBench R15 in a single-threaded mode. The test is 3D modelling, which doesn’t apply to that many consumers, but it is a good way to gauge how the laptop reacts to light loads. The results pretty much declare a tie among all of the 8th-gen based laptops with a decent, but not huge bump over most of the older 7th-gen Core i7 laptops. You can declare single-threaded performance mostly a tie among all of the 8th-gen Core i7 chips we’ve tested. One issue with using quick-running benchmarks to gauge CPU performance is it doesn’t tell you how a particular laptop behaves under longer loads. For that we turn to HandBrake, which is a free and popular video encoder. For this test, we use an older version of HandBrake and convert a 30GB 1080p file using the Android Tablet preset. 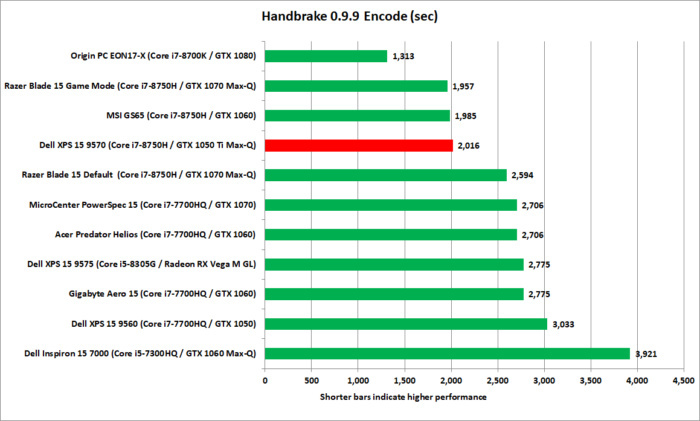 Rather than the minute or two it takes to run Cinebench, the HandBrake encode takes 45 minutes on a quad-core and about 30 minute on a six-core CPU to run. The test is good at revealing when a laptop can’t handle the heat or decides to run slower to keep the fans quieter. We again see nearly a tie of the three 8th-gen Core i7-based laptops, which all finish encoding the video a healthy clip ahead of the quad-core CPUs. Our HandBrake test takes from 30 minutes to 45 minutes to run and is a good measurement of how a laptop handles heavy workloads. While the 8th-gen Core i7 is the star of this update, Dell has also taken the time to put a new GPU inside. That’s the Nvidia GeForce GTX 1050 Ti Max-Q part. The ‘Ti’ is a step up from the last-generation XPS 15 with its plain GeForce GTX 1050, but you also have to take take note of the Max-Q, which means it’s a power-optimized chip. From the performance front, it’s like a GeForce GTX 1050 plus plus, but then minus. As you can see from 3DMark FireStrike, the overall performance moves forward (this particular tests also factors in the CPU performance). The GeForce GTX 1050 Ti Max is like a plus plus and then minus over the GeForce GTX 1050 GPU. 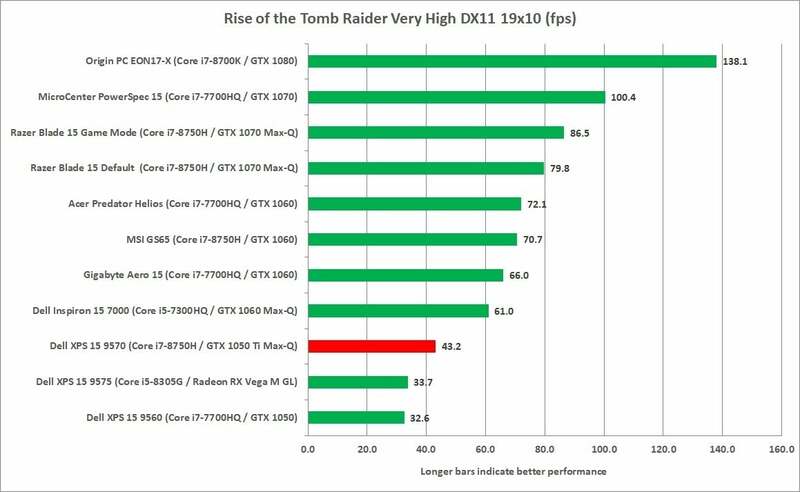 Moving on to actual game performance, the GeForce GTX 1050 Ti Max-Q is in the mid-40 range in frame rates in Rise of the Tomb Raider. The comfort level of the GeForce GTX 1050 Ti Max-Q seems to be 720p at very high to ultra settings, or 1080p at low to medium. It all, of course, depends on what game you play. Rise of the Tomb Raider is probably best played on a lower game setting to push the frame rates up a little bit on the XPS 15. Battery life is perhaps the most important spec of any laptop, and good news with the Dell XPS 15. We clocked in 14 hours of video playback at a relatively bright 250 to 260 nits, using the built-in Windows Movies & TV Player in airplane mode. Compared to the last-generation XPS 15, with its 5 to 6 hours, it’s a smackdown. Much of the battery life disparity can be put on the screen. The XPS 15 9560 featured a 4K IGZO panel with touch support. The XPS 15 9570 features a 1920x1080p touchscreen. Although the IGZO technology in the 4K panel helps power consumption, it’s still about 8.3 million pixels pushed into a 15.6-inch panel, versus the 1080p’s 2 million pixels. The smaller the holes, the more light you need to push through it. Other factors work into laptop battery life, such as driver optimization, but in the end, this is about how long you ran. The XPS 15 with the FHD screen gives up some stupidly good run times. 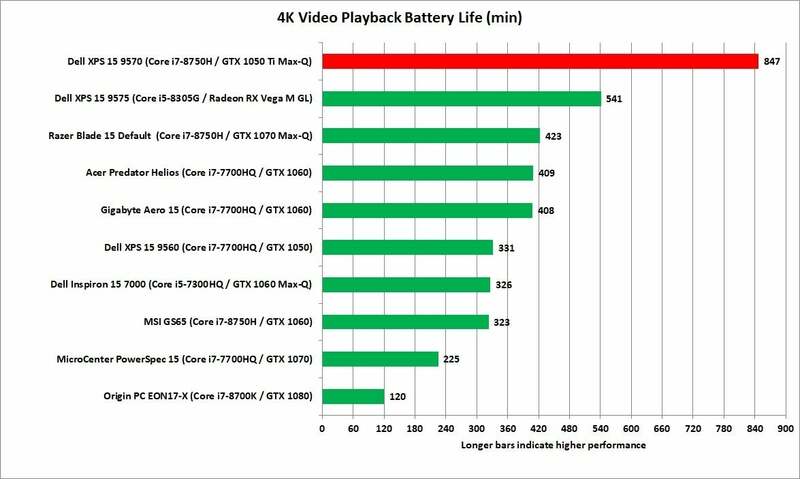 The XPS 15 offered a crazy 14 hours of video playback time. Dell XPS 15 9570 Overheating problems? When you pack a lot of hardware into a small package, there’s always a compromise to made. In the case of the Dell XPS 15, it’s been documented that under very hard loads, it can throttle in performance. This isn’t new, nor a limitation unique to the XPS 15. Much hay was made when Apple’s newest Macbook Pro 15 heavily throttled under relatively light loads. With the XPS 15, the weakness has mostly been the cooling for the voltage regulation modules on the motherboard. When heated up under harsh loads they fail to supply the CPU with enough power, so it downclocks to, say 1GHz, until power ramps back up. 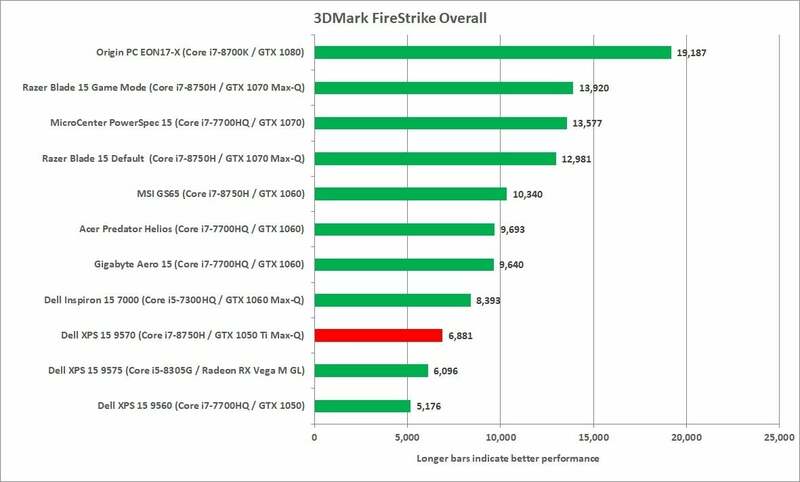 We can replicate this using torture tests such as Prime95 and Furmark run simultaneously on the XPS 15. Is this going to be a problem for you? Probably not. That’s because few workloads stress both the CPU and GPU to 100 percent at the same time. It’s just rare with today’s workloads. In fact, the XPS 15 succesfully ran 3DMark’s Time Spy stress test 20 times without issue. We then ran it 40 times and passed and finally, we ran a 100-run iteration with a passing grade. The problem may exist, but it looks like you’d need to try hard to run into it. 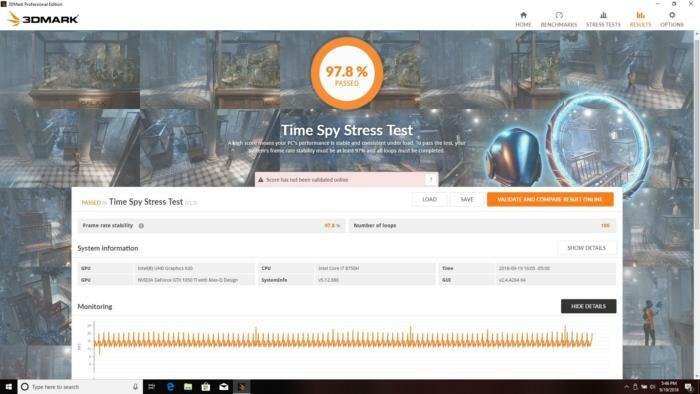 Based on current pricing, tWe ran Time Spy’s stress test 100 times with no issues on the Dell XPS 15. The other sticky point is going to be graphics performance. With gaming-focused laptops getting nearly as small (Razer Blade 15) and even lighter than the XPS 15 (MSI GS65 Stealth Thin 8RE), their more powerful gaming GPUs make them awfully tempting compared to the XPS 15. Sure, they often come with weight, heat, and cost increases, but when you’re looking at a GPU twice as powerful as what you’ll find in the fanciest XPS 15, some may find those burdens worth bearing. Those considerations aside, the XPS 15 9570 is still about as powerful and compact as you can get. It’s basically the same laptop many have embraced since it was introduced two years ago—except faster. Based on current pricing, we have our favorite among the many XPS 15 options available. The unit we received for review, with its Core i7 CPU, 16GB of RAM, GeForce GTX 1050 Ti Max-Q, FHD panel, and 256GB SSD, cost about $1,700 at the time of this writing. Dell has since tweaked its configuration to offer a version with 8GB of RAM, currently selling for $1,400 on AmazonRemove non-product link. While that sounds appealing, for this class of laptop, we’d probably opt for the next step up, with Core i7, 16GB of RAM, and 512GB SSD, currently selling for $1,750 on AmazonRemove non-product link. On the lowest end, Dell has a stripped-down XPS 15 for $1,000 that does away with the graphics card and trades the SSD for a 1TB hard drive. Our advice? Don’t do it. The lack of the GPU isn’t as painful as the lack of an SSD. A hard drive in anything but the cheapest laptops just doesn’t feel right. On the high end, Dell offers a $2,500 XPS 15 with 32GB of RAM and a 1TB hard drive (available on AmazonRemove non-product link). You can never have enough storage, but unless you’re sure you need 32GB of RAM, it probably makes more sense to add a 1TB SSD to the $1,700 version above for $200 more. 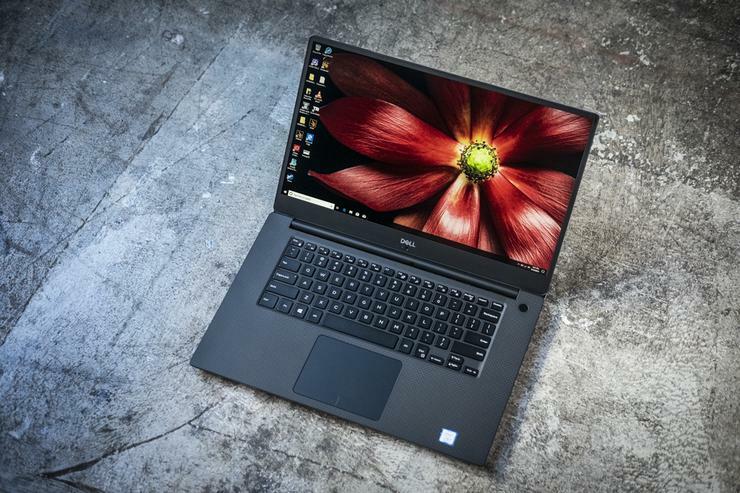 For those into their high-resolution material, Dell’s very top XPS 15s offer 4K screens along with 32GB of RAM and 1TB SSD standard. Of these two, we’d opt for the model with the Core i7, currently going for about $2,500 on AmazonRemove non-product link. Dell offers Core i9 versions such as this $2,999 model on AmazonRemove non-product link, but we can honestly say the investment on the higher clocks of the Core i9 probably aren’t worth it for most. In the end, the best XPS 15 to buy is the $1,750 configurationRemove non-product link with Core i7, 16GB of RAM, GeForce GTX 1050 Ti Max-Q, and 512GB SSD.